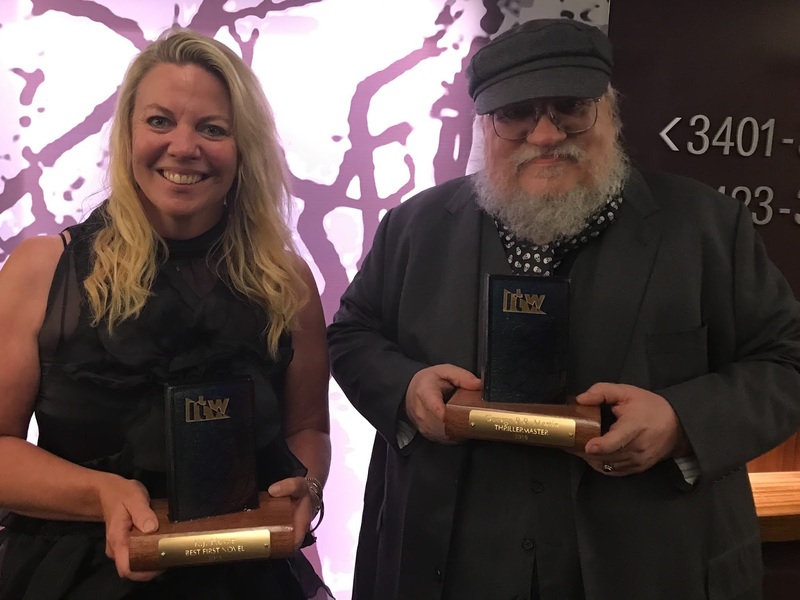 ThrillerFest XIII was a sensational event from stem to stern. S. Lee Manning's upbeat debriefing on Sunday covered many of the highlights, and I deeply appreciate her kind congrats regarding my winning Best First Novel at the banquet on Saturday evening. As I recover from the dynamic week, I'd like to share a few things I hope will help aspiring writers, published authors, and anyone who might be struggling in this ever-changing business. *It's a marathon, not a sprint. During George R.R. Martin's spotlight interview, he shared that after his fourth book, which was a critical success but did not sell well, he was unable to sell his fifth book at all. Full stop. As George shares, "The Armageddon Rag (1983) essentially destroyed my career as a novelist at the time." Did George stop writing? No, but he shifted gears and wrote television scripts for the Twilight Zone, and then became a writer and showrunner for Beauty and the Beast. After he had financially re-established himself, he decided to try novel writing again in 1991. Game of Thrones took off, and look where he is today. Lessons learned? Adapt and survive. *There are many ways to be successful. Traditional publishing is not the only route to superstardom. We had Mark Dawson, Kevin Tinto, Lexi Blake, and several other super successful indie authors onsite this year. These talented individuals have a keen business sense, and they have been able to become entrepreneurs by utilizing strong marketing skills to break through the noise. Depending on your personality and talents, one type of publishing may suit you more than another. But in either approach, a thorough knowledge of the business aspects and an enthusiasm for marketing are vital for success. Learn how to spread the word, as discovery is the first step in readers finding you. Then you can convert them into fans. *No writer is an island. Publishing is a complicated business that changes all the time. You need to surround yourself with supporters, people with skill sets that compliment yours--and people who understand what you are going through. I spoke to several friends onsite who had been dropped from contracts for poor sales or have been orphaned by staffing changes. In fact, I've lost both my original U.K. and US editors, and I've only just published my second novel, SKYJACK. It's heart-wrenching to lose your champion, the person who had vision for your book and series. But you have to find a way to adapt, and talking to authors who have gone through this experience before will be able to guide you, offer sage advice. Robert Dugoni has achieved blockbuster success with Thomas & Mercer, setting records all the time. Yet at one point in his career, things were bleak, and he wasn't sure he could sell another book. I admire Bob's tenacity. His family and friends supported him through the tough times, and now he has become an icon. I love being part of the Rogues, as I know that our members are very supportive and offer a soft place to fall when things don't go well. *Write a damn good book. Master CraftFest and CraftFest offer valuable writing advice for new and published authors. Writers are entertainers, and we compete with video games, binge watching TV shows, surfing the internet, and a host of other activities. We need to offer readers compelling tales with seamless prose, stories that really resonate and stay with readers long after they finish the book. Go the extra mile and study the craft of writing, as it will make you stand out in a crowded field. Dig in, attend intensive classes. Our own Rogue Gayle Lynds is a talented teacher who understands the art and craft of storytelling. Students in her class benefit from her insights as well as her understanding of the business of writing. She gives back to the community tenfold. I'm a big believer in honing your craft. I have studied writing at retreats with Lee Child, David Morrell, Karin Slaughter, and Steve Berry, and each one of them helped me learn about writing, offering an objective analysis of my book. I'm forever grateful for these lessons. And Karin saw something worthwhile in my scribblings that she offered to introduce me to her agent, who is now my agent. *Never give up. It will be hard. You will face rejection. You will have days that it all feels hopeless. But if you're meant to be an author, you will find a way to weather this adversity. It may take years, even decades, but if this is your dream, don't let anyone discourage you. 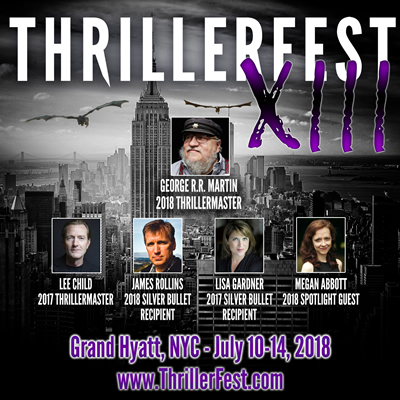 I've been executive director of Thrillerfest for nine years now, and I've seen people come back year after year trying to get published. Then one day, something wonderful happens. My friends Lynne and Val Constantine are perfect examples. They came to the conference, always volunteered, learned, worked on their craft--and today, they are bestselling authors. Reece Witherspoon chose THE LAST MRS. PARRISH for her Hello Sunshine book club. What if they had given up because during the tough times? I'm a big believer that if you want it badly and you work hard, you can do it. It's 10% talent and 90% effort. Find your tribe, rally your troops, and ride their energy and your inspiration through the rough spots, and you will find the path to success opens up for you at the time you might least expect it. And have fun along the way. Even the rough times teach you life lessons that will give you fodder for your next book! Great advice! Thanks so much for posting. It doesn't matter where you are on the ladder, whether climbing to the top or just climbing on for the first time, it's important to remember that at any given time in your career, you'll find no rung beneath your feet. I've lost editors mid-series, twice had series dropped, and been left feeling bereft, wondering where I'd go next. I can say that having attended conferences directly contributed to getting past those obstacles and getting right back on that ladder. Terrific recap and advice -- I think we've all "been there" with the ups and downs of finding an agent, an editor, a publisher and figuring out how to market a story. I recall one bestselling author opined that he ends up spending 25% of his time writing and 75% marketing. I hope it doesn't come down to that because what we all truly want to do is put our thoughts, ideas, and plots to paper. I hope many aspiring writers read your great post and get inspired to move ahead.